Lana was born in 2357 in Smallville, KS. When Lana was three years old, she saw her parents, Lewis and Laura Lang die in a horrible accident. Her aunt, Nell Potter, adopted her. Lana's best friend in her childhood was Emily Eve Dinsmore, but Emily died trying to save Lana from drowning when they were ten. Lana was a cheerleader as a freshman. She dated Whitney Fordman as well as was admired by everyone, but just a month or two into the school's year, before the football season ended, Lana decided to quit the cheer leading squad and try something else, in search of her own identity. In her quest for identity, Lana found her mother's journal and learned that she was not happy in Smallville. Lana's quest for her own identity lead Lana to decide to enter Starfleet. At the age of seventeen Lana enrolled at Starfleet Academy majoring in security. Her first assignment was the medical ship USS Olympic. 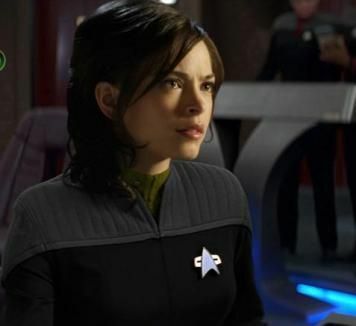 Finding life dull on a medical ship as a security officer Lana requested another assignment and was transferred to the USS Odyssey a new class of ship and the largest to date built by Starfleet.